"This is my mom's Puerto Rican comfort soup. The mix of vegetables and herbs is an influence of the Spanish Canary Island ancestors of some Puerto Rican families. The soup was adjusted to the vegetables available in Puerto Rico by the addition of corn and pumpkin. In the Canary Islands of the 1700s, corn was only fed to farm animals! In Puerto Rico, some cooks now add ginger root, chile pepper, cumin, and other ingredients but I believe it destroys the original rich natural vegetable taste. 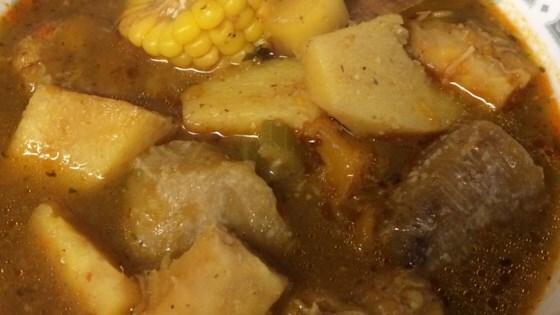 Similar Spanish sancocho recipes were passed on to other Spanish colonies such as Columbia. Serve hot with bread to soak up the delicious flavor." Heat olive oil in a large pot over medium-low heat; add onion, garlic, cilantro, white pepper, oregano, and salt. Cook and stir until onion is browned and very tender, about 20 minutes. Add stew meat; cook and stir until meat is browned on all sides, 5 to 7 minutes. Pour enough water over meat mixture to fill pot 3/4 full; add tomato sauce and beef bouillon. Mix green beans, carrots, celery, chayote squash, white beans, cabbage, green banana, yellow plantain, llautias, potatoes, pumpkin, corn, and green bell pepper (in this order), cooking and stirring after each addition. Cook until all the vegetables are tender and stew has formed a rich broth, 2 to 3 hours. Add more water or salt if needed. What's cooking in Allentown? Milly's authentic stew. Many of the vegetables can be found in the International Markets. Several have alternative names. Llautia may be Yautia or Malanga. Chayote is a type of squash. Name, a root vegetable, can be used in place of 1 of the potatoes. Not quite like they make it in Panama but this is VERY tasty!